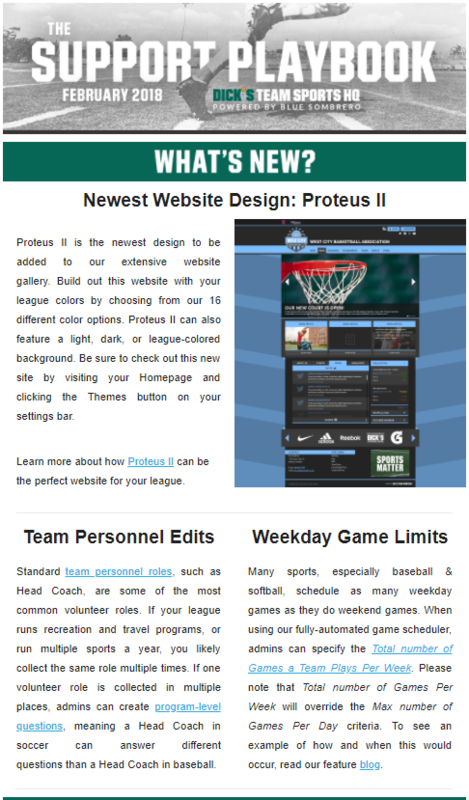 In this edition of our monthly Support Playbook, we highlight the newest edition to our Website Design gallery, Proteus II, along with our biggest product updates around Program-Level Team Personnel and Weekday Game scheduling capabilities. Team Sports HQ welcomed a few new partners in February as well, including US Youth Soccer partners Virginia Youth Soccer and Missouri Youth Soccer, along with a new national partner in The Small Sided Soccer Association. Admins will also be notified of these product updates via an in-app message every time a release is pushed. If you ever want to look back at past messages, you can click the green icon in the bottom right corner of your Team Sports HQ website, once you are logged in.